I felt bad about the Otterloops not getting a vacation this year so I squeezed one in. 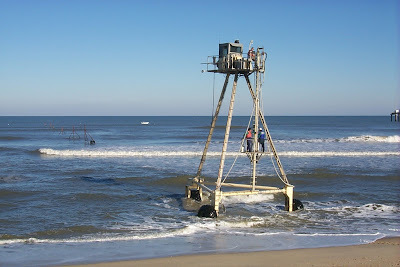 Their last two trips to Geek's Neck were much more extensive, in part because I've always found beach towns hugely entertaining places and fun to parody. In the early 80s I tried to put together a strip about a beach town called Geek's Neck, loosely based on some of the towns scattered along the Mid-Atlantic coast that I know, like Ocean City MD, or Rehoboth DE, or anything on the OBX. But it was a half-hearted attempt and I gave up. And here's a Bonus Unnecessary Spot Illustration for Today, this one for an article about college kids trashing beach houses for Smithsonian Magazine several years ago. Well, yesterday's. Several readers have rightly complained about the lack of 3-D viewing glasses on Mom and Alice in this strip. It so obviously spoils the joke and renders the whole thing illogical and confusing. In my defense I can only say, I forgot that the audience had to wear glasses for the 3-D effect to work I've been to only one 3-D thing, an amusement ride with pirates in it and all I remember is a flat parrot inexplicably flying at me and the brief resultant headache afterward. Also, I was drawing this so close to deadline that the printers were loading rolls of newsprint into the presses even as I was putting ink to paper, leading to one of those exciting race-against-time montages of an inexorably spinning roll of newsprint cutting to pen scratching on bristol board, back and forth in quick succession, till Wham! the cartoon is finished, scanned, sent, distributed and arrives at the printers just in time to make the Sunday edition and anger readers by its lack of 3-D glasses. I had so much fun at the Baltimore Comic Con yesterday I'm going back again today. As I was sitting at my table all day Saturday, this time I plan to get up and walk around more and take in the sights. If you're one of the sights there I hope to see you. I got nothing to say, except to remind you it's Read Comics in Public Day, and that you should celebrate by going to the Baltimore Comic Con. As I mentioned I've got a table at the Baltimore Comic Con for today only thanks to John Gallagher, the genius behind Buzzboy comics, in his Comic Book Diner Fun Zone. 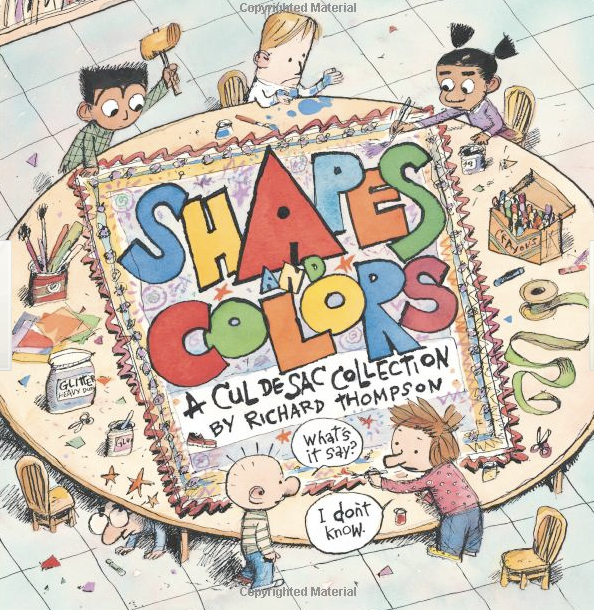 I'll share a table with my friend Shannon Gallant, and I'll have a pile of books- all three Cul de Sac collections & Richard's Poor Almanac- and the 2011 CdS calendar, various other merchandise, and original strips. So I hope some of you good people stop by and take this junk off my hands because, really, this house isn't big enough. About 20 years ago PBS showed a filmed version of Jean Shepherd's antic short memoir Ollie Hopnoodle's Cabin of Bliss. Shepherd is, of course, the author of the collected works that was turned into A Christmas Story, and he had a long career as a writer, raconteur, radio & TV host and other things as interesting. Ollie Hopnoodle was about the annual family vacation to a lakeside cabin, and one bit was about the bee that annually invaded the family car on the way to the cabin, supposedly the same damn bee every year. In the TV version it was wonderfully staged: the late '40s car coming to a sudden halt on the country road and the four family members jumping out, most of them dancing around and swatting and the youngest taking off lickety-split down the road, away from the camera. The camera held on them for a little while and it became funnier as it went on, especially the youngest gradually disappearing into the distance. Anyway, I remember that pretty vividly and I laughed when I thought of this strip. It's not real inspired, and when I make myself laugh it's usually a warning sign of lameness. But it did let me off the hook as far as thinking up the full title of Petey's comic book is concerned. If you get a chance to see Ollie Hopnoodle sometime jump at it, and read the book too. 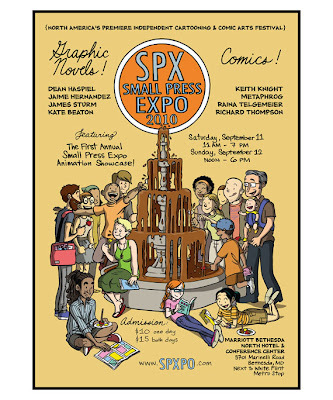 The Small Press Expo site has just put up the programming information for 2010! And look, there's somebody with my name on it! Even better, there are some of my favorite people listed, too many to repeat here as I'd leave someone out and feel bad. So take a look, mark your calendar, and show up ready to be entertained, enlightened and something else that starts with en-. 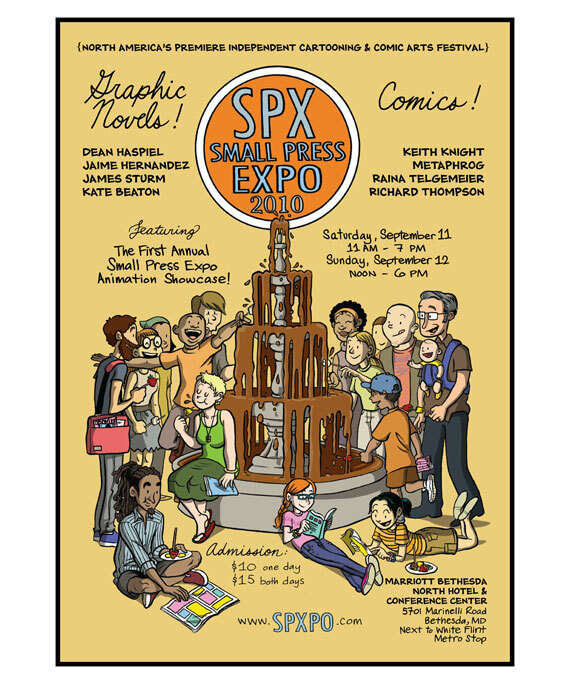 Really, SPX is a good time! In the rough for this strip the text for Loris's middle balloon ran on and on with the words getting smaller and smaller and it looked, I thought, real funny. But when drawing the final it became obvious that all those words wouldn't stand any reduction and it just looked messy and self-indulgent, so it got curtailed into shorter and less funny form. That's pretty much all these daily posts will be from now on: evasive explanations of how that day's strip was really funny until it got drawn. In answer to the many, many queries I've received from both of you, yes, Loris and Andre will be in the strip from now on. Not every day! Andre's too big and Loris wouldn't hold still. I've been trying to expand Petey's end of the strip for a while to give him more room to socialize, and I like these two just fine and they're both fun to draw. Expanding a comic strip is always a dicey business as strips are fragile little soap bubble things, so I won't push it too far and pop it. Introducing all of Dill's brothers, for example, would tear the whole space-time continuum to tatters. Though that might be good for a one-time laugh. Today is National Dog Day, so here's an appropriate repost, this cartoon having run 4 or 5 years ago. I dedicate it to my friend Nick Galifianakis, who draws the best dogs around, and who just lost his beloved friend Zuzu. I've been slack in posting these vitally irrelevant spot illustrations, so here's one from the Washington Post Magazine of about 13 years ago. The story accompanying the drawing dealt somehow with alcohol in politics and these two, Grover Cleveland and Calvin Coolidge, represented two extremes on the drinking-alcohol spectrum; most bibulous and most teetotal respectively. I'm pretty sure I stole Coolidge's head shape from a caricature by the spectacular Miguel Covarrubias, though it does have a proto-Peteyness feel that creeps me out some. And the handling of the watercolor is kind of soft and timid. But I do like the looks of mutual disgust that flash between the former presidents. Here we have a teachable moment: "borborygmus" is the scientific term for "stomach growling" (plural borborygmi, pronounced /ˌbɔrbəˈrɪɡməs/; from Greek βορβορυγμός). It comes from the ancient belief that digestion was the purview of a grouchy dwarf named Borbory residing in the stomach. His grousing at the lousy job he had pushing food around your innards, instead of bowling with his cousins, was heard as a growling sound, as opposed to the more dignified thunder that his bowling relatives caused. I think that's right; it's late and the mind wanders, y'know? Anyway, the Stapling Ceremony seemed like a good way to wrap up the whole Cartoon Camp story and gives everybody a chance to dress up. The kids might be dressed as their titular superheroes, though that undercuts the fact that Petey isn't a big fan of superheroes- he's more likely to enjoy Jimmy Corrigan or Pim and Francie. Which is not to say his taste is sophisticated, just grimmer than a taste attuned to the gaudy spectacle of superheroics. By now superheroes are mostly beyond parody. Stuff like the Tick and Herbie Popnecker pushed the absurdity of the tights little world about as far as it could go while still being funny. But the actual genre is its own best parody. I'd originally used the name "The Kaboomerang Kid" in Andre's comic title. A quick googling let me know that Kaboomerang is already a superhero who throws exploding boomerangs, of course. 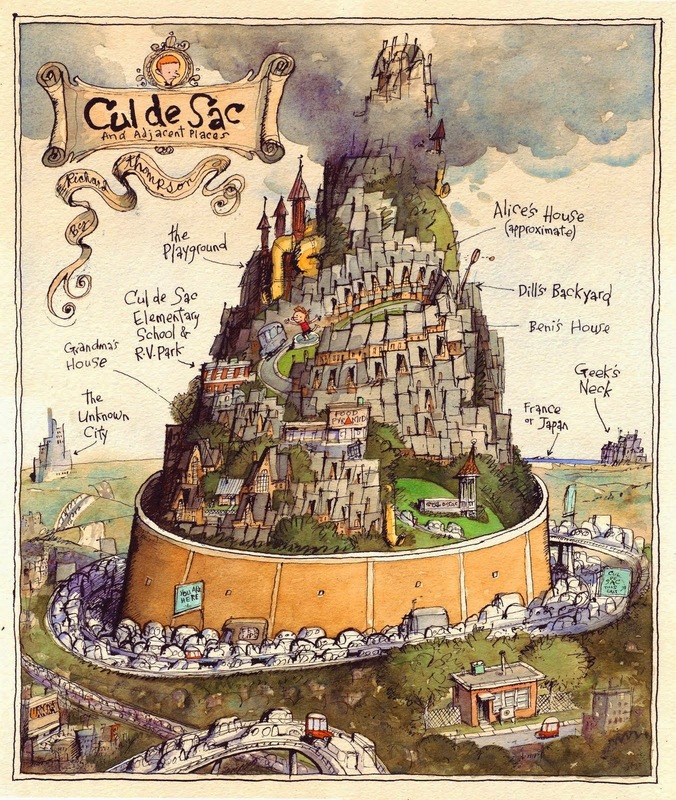 Publisher's Weekly, for years the industry bible for news & reviews, has nice things to say about the Cul de Sac Golden Treasury (for which you'll have to scroll down slightly at the link). They even gave it a star, which, critically speaking, is comparable to a Happy Face Sticker for Work Well Done. My thanks to mighty Mike Lynch, whose blog is more informative than this one, for passing this along on the Twitter. Looking at this now I wish I'd put in a little more background. It had some in the sketch, but I worried about the busyness it might inflict, what with the top-heaviness of all those words and the silly costumes to look at. And the vital importance of drawing the eye to that stupid, old-timey-looking stapler. Petey's favorite distancing mechanisms were first mentioned back when he tried to wear it to his oboe recital in one of the old Post Magazine strips and again when he wore it to Thanksgiving dinner. I had a box of hats when I was a kid and whichever hat I chose for the day would define who I was that day. My favorite for a long time was an orange plastic helmet that said Dennis the Menace on it. I didn't turn into Dennis the Menace when I wore it, but it was a good looking hat. I also had an array of capes, most of which came from the towel shelf in the linen closet. I haven't done much with a dress-up theme, a glaring oversight as dressing in silly costumes is a vital part of childhood. Except for the above, a strip that originally appeared in the Post Magazine and got reused as a Sunday. In one of next week's strips a Dress-Up Corner is mentioned at Blisshaven and that might be the beginning of a new whatchamacallit: a new "meme". If that's the word I want. To reference another British movie, there's a character in The Snapper, a little girl in an extensive family, who appears in completely different get-ups in every scene. Including a drum majorette outfit and once with shaving cream all over her head. That made me laugh and stuck in my head as a useable idea for future whatchamacallit: future "homage". No, "theft" is the word I want. Dill's Grand Tour of local places of interest. As happens too often, I didn't know how this should end when I started it. This leaves open all kinds of possibilities, very few of which are necessarily funny. Having someone else barge into the strip is always a good solutions; it enlarges the conversation, gives a sense of life & activity beyond the panel borders, and offers me an easy punchline when all the other characters may be all talked out. Actually what this one mostly offered was a chance to draw some pretty simple still life-landscapes and only a few people, which is good when deadlines are nigh. Though drawing the great dirt was harder than I thought it might be. 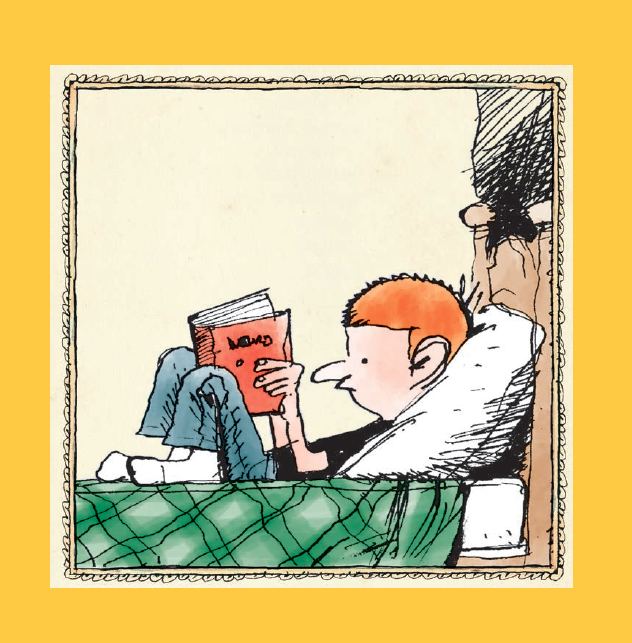 I'd forgotten it, but the subject of socks in trees was discussed previously in Cul de Sac as part of a visit-to-the-library arc, back when the strip ran in the Post Magazine. Cartoon genius Stephan Pastis, whose approach to writing Pearls Before Swine is an adroit balance of left and right brains, has talked about having a go-to character he relies on when the ideas aren't flowing freely. That is, a character who'll inspire him, who's personality is forceful enough that he or she will pretty much take over the writing chores. For Stephan it's Rat: of course it's Rat, the evil characters are always the most fun to write because they're the unconstrained ids who can get away with stuff. I'm not sure I've got a real go-to character, but I've always got Petey and when he's lying on his bed reading and half-ignoring Alice's unwanted presence the writing is always pretty easy. And it's pretty fun to draw too. A few times earlier on I varied the perspective a little or showed the bed from the other side, but it usually works best shown as it is here. It's easier to draw and looks more iconic, "iconic' being a nice way of saying if you repeat an characteristic image often enough it sticks in people's heads. There'll be a delay in posting Today's Cul de Sac. To make up for it here's a distraction- I've just noticed that Shapes & Colors, the third in the regular, non-golden-treasury Cul de Sac books, is up at Amazon. And it's got the Look Inside feature, so you can preview a few random pages. Including the foreword by Petey Otterloop, who thinks the strip is Okay, but he's seen better. Alice's final appearance as a family spokesman. I've finally figured out a resolution to her fish-slapping-bear obsession, though that won't happen till at least December of 2013, as I'm working that far ahead (insert sarcastic-laughter emoticon here, if there is such a thing). Actually I'm nowhere near there, so if you'll excuse me I'm going to go finish a Sunday strip for this Sunday (not really! you can put that same emoticon here, only make it slightly more rueful). And to make matters worse, I'm going to close with a commercial message. On September 9th I'll be signing copies of the Cul de Sac Golden Treasury at Politics & Prose along with the wonderful Keith Knight, who'll be signing The Knight Life: Chivalry Ain't Dead. For a small fee, we'll switch over and sign each other's book instead. There may be a talky thing beforehand, which I'll let Keith handle as he's vastly more entertaining than I am. More details here. Petey's world is suddenly larger and more populous than he's entirely comfortable with. But then, Petey's comfort zone is somewhat smaller than his own actual physical size, so it's easy to get him outside of it. There: that's what we've learned today. But we knew it already, so we may have wasted a day. If I was home and had access to some older drawings I'd make this post be about paintings in cartoons, in this case their use as indicators of space. You'll note the two framed pictures of something in the background of panels one and two. They're both used as a simple way of identifying a flat interior wall and marking the depth of the set in this scene. 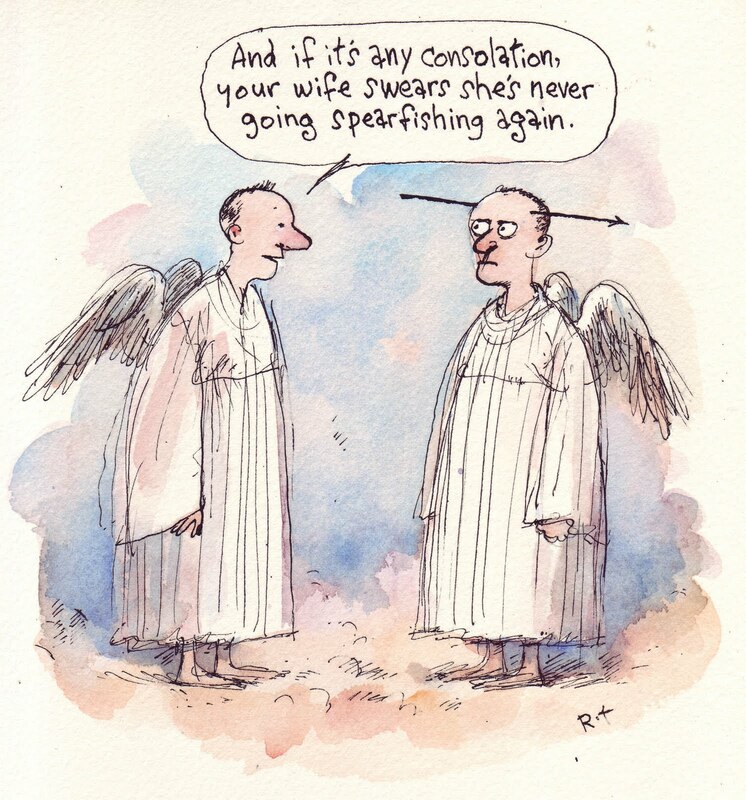 See, for better example, the masterful Wiley's signature black-matted art hung so adroitly all over Non Sequitur. I get antsy drawing backgrounds; too much is confusing and too little looks lame. And interiors are harder than exteriors. It's easy to draw a patch of grass or a stray tree branch, but drawing a room? You draw a lamp and you have to put it on a table and suddenly you're drawing the carpet too and it's getting busy. But if you keep it simple and go with a blank wall or a strip of floor molding it's easy; for a strip featuring small kids I draw that all the time, usually with a nicely space-defining expanse of tile or wood panel floor. And a note to future researchers, please notice that when drawing a lower wall, as often as I can I put in an electrical outlet, both as a way of identifying that blank area as a wall and of introducing a potential hazard. So, there: that's what we really learned today. Alice the family spokesman goes off-topic, releases too much info, is recalled for consultations by higher-ups. The idea of doing this as a press conference came to me when I realized that the Petey-Andre Playdate would be funnier off-stage, a clever cover-up for the fact I couldn't think of much for them to do that was funny. In this strip I like the crosshatching in panel two and the stray corn-popper in panel one. I regret not squeezing that popper into panel three. And now an update from a previous post. I mentioned a scene in the movie Gregory's Girl and wondered if I remembered it correctly. Dan Halbert kindly sent me a screenshot and a fuller description. Dan writes, "Gregory leaves for school (late). As he goes out his front door there's a mass of small children, and he has to step through them as he goes down the walk (and encounters more on small moving vehicles). One is also in a small tree. A short time later he is almost hit by the student driver his father in instructing." Thanks, Dan! My readers are the awesomest! They can screenshot rings around the readers of most blogs! This continues a tradition of running this on the anniversary of his passing, though I usually forget to. So it looks like we've got a theme this week: Alice the Media Mouthpiece. Which seems to make sense, as Alice, in her natural state as an attention hound, would gladly exploit Petey's meager adventures if it'd bring her an audience. 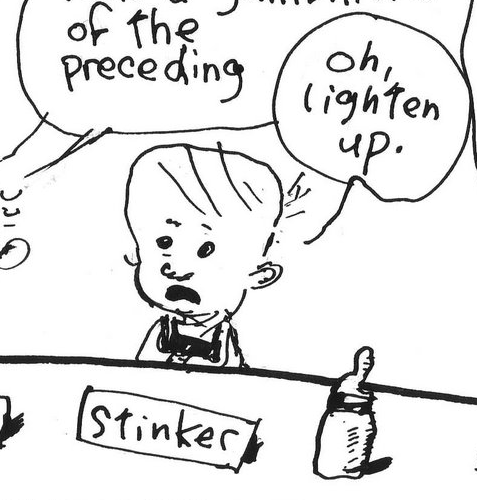 As in yesterday's strip, the fun in this was mimicking the language of the press secretary. The second panel as originally written had Alice giving out a thicker chunk of boilerplate, something like, "We currently await confirmation blah blah hopeful of a positive response in this matter blah blah something." I forget how it went (I shouldn't be so quick in tossing out roughs) but you get the idea. It was too much and it got expunged. 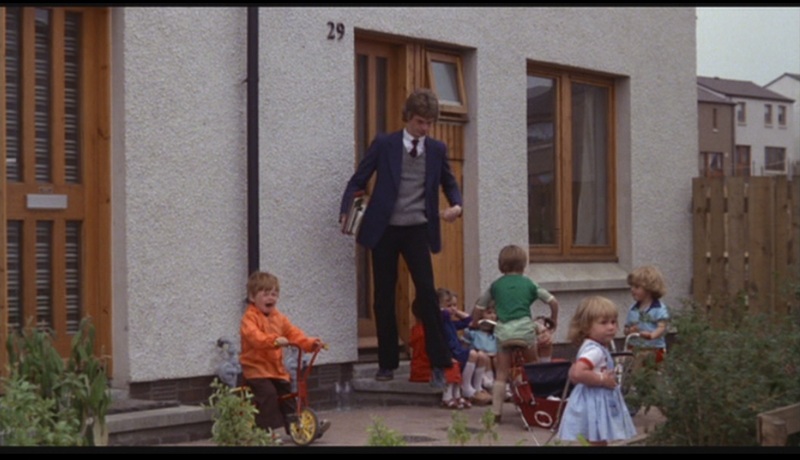 There's a scene in one of my favorite movies, Gregory's Girl, that I hold dear. The title character, Gregory, is a gangly Scottish teenager who lives in a kinda faceless suburban development, and there's a brief bit where he steps out his front door, I think on the way to school, just before his father accidentally almost runs him over with the car while taking driving lessons. And there's one shot a few seconds long of him standing in his tiny front yard surrounded by small squally children out playing, just a brief tableau of him looking lost and befuddled in the midst of all these feral toddlers. It's a scene that keeps popping into my head when I work on the strip as it seems emblematic of, I don't know, the collision of mutually ignorant worlds or some such thing. I haven't seen the movie in years and may be completely misremembering the whole bit, in which case I've just embarrassed myself and exposed my whole world view as built on a poorly recollected shot in an obscure movie. From about four years ago. This launches a week of strips that made me very happy when I wrote them. When I first write out a strip I put down everything I can think of that might work for the gag or situation I'm aiming for, hoping that the run on, disconnected phrases will find their own level of sense or cancel each other out, or spur me in a more interesting direction. With this week's strips it was mostly getting the language right to make the parody obvious, and I kept changing it right up to the final lettering. And probably fussed with it some in Photoshop. Commentary like this reminds me of a New Yorker cartoon of a man watching an actor's DVD commentary track; the caption is something like, "Watch me in this scene! I'm really great in this scene!" So I'll shut up for now. Besides, it's like 3 AM in Duck, North Carolina. So I've got a table at the Baltimore Comic Con, which runs the last weekend of August (28th and 29th), though I'll only be there on Saturday. John Gallagher, the genius behind Buzzboy comics, kindly found room in his Comic Book Diner Fun Zone, where all the fun people are on the con floor. I'll share a table with my friend Shannon Gallant, and in lieu of comics we've decided to run a sticky carnival food stand with cotton candy, funnel cakes and soft-serve ice cream, as so few treats of this nature are ever available in close proximity to printed material! We'll see how that goes. And, weirdly enough, I'm up for a Harvey Award, the annual multi-divisional honor named for the great Harvey Kurtzman, and hosted by the Baltimore Con. I hope I remember to wash my hands first. I don't have access to the B&W file for this strip right now, so this is a screen shot of the color file on Gocomics. 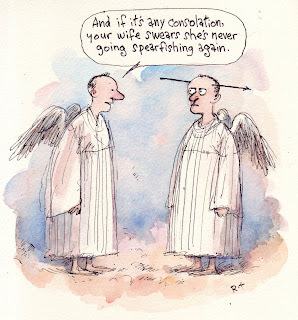 Sunday strips are more often than not about something fun to draw that's not too hard. This one started out as a vague idea of drawing Alice in a shrub, much like one I'd done as a daily strip for June 24th (below) and pulling gradually back to show the shrub turning into a vast viney, jungly place with lots of little yellow eyes popping open in the dark masses of foliage. But I didn't know why; was she just imagining this and going from relief at her seclusion to fright at her loneliness? It probably would've worked, but I took the I-want-to-draw-foliage idea and dragged it in another direction. Whatever. Alice's Tarzan Shrub holds enough potential for variation that it's earned a role as another place in the strip, along with her manhole cover and Petey's bed. 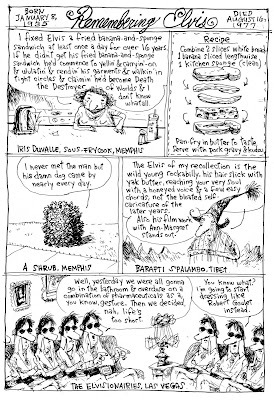 Using repetitive scenery in a strip is one of the basic rules, obviously; it's a comic strip version of seeing the world in a grain of sand (which may be a little pretentious, but I'm at the beach so I've got sand on the brain. Also in my shoes and pants). Working on a strip for even just this little while has made me more aware of how important places are in a comic strip, even these days when it's difficult to squeeze any landscape or background in behind the talking heads. It reassures the reader to see the same place, the same sets, used day to day and lets a cartoonist build the tiny world his characters need. And another thing I've noticed is; I like fairly simply staged action on a stage without to much depth to it. The brilliant illustrator & author Lane Smith wrote something on his blog about preferring to stage everything on the same flat plane as it makes the humor more deadpan, and likening it to such classic comedy as Buster Keaton movies. That's my favorite way of directing a strip- the only real movement is the characters, usually left to right, and the camera sits there and takes it all in. There's little change if any in the point of view and it exaggerates the smallest actions or changes of expression. It can be a lazy way to work, which is fine by me, but it can cut down on the strip's visual interest. Like, look at this recent Velia Dear by the wonderful Rina Piccolo. Her camera swooped down from the rooftops without any fuss and kept the focus and the depth of field. I worry when I try that kind of thing for fear that it'll get incoherent and also because I'm scared of heights. This is a repeat of a post from 2 years ago, but it's happening all over again. As always, you're invited to leave a comment in the form of a joke, anecdote, poem, thought for the day, etc. I may get to look in on this thing while I'm in Duck, or even in France. And I'm taking work along so I'll need all the distractions I can get. Okay, I've run out of things to say. No I haven't! Ha ha, I was kidding! This is the Saturday part of the little story arc where, as I mentioned, there's a pause for commentary or mopping up. And I just noticed something; this strip enlarges on themes presented in Tuesday's strip, specifically Dill being slightly clueless and somebody saying DARN in frustration (only this time louder). If I had an academic bent I could probably draw some conclusions from the persistence of these themes, but my bent is slackjawed ignorant so it's more likely I thought of the same jokes within a span of days but didn't realize it. 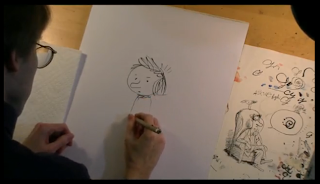 About half the time, maybe more, Cul de Sac follows a story arc. The arcs are usually pretty brief and flexible enough that they can change shape or direction without hurting the forward momentum, because there isn't any. It's a luxurious way to work because it can only go wrong by being boring. I like tangents and a daily comic strip is a great way to indulge in tangential thinking; there's always tomorrow to get things back on track (if that's really necessary) so I can keep a loose grip on the reins. For a little arc like Petey's Playdate, the only thing I have to keep in mind is how long it's going to be and what day a particular strip is going to run. I posted once a while back about what my first rough of a week's strips looks like, and it's pretty unimpressive. But basically, the arc is always divisible by six, or Monday through Saturday, with Monday launching the story and Saturday (a day few people supposedly read the paper) reserved for clean up or commentary. Friday should be the peak of the story, when excitement is at its most white-hot and lives are in the balance. And here it is! All our protagonists and antagonists are in the same room and here comes the flabbergasting plot twist- Alice barging in with all her toys, brandishing her whole gigantic personality like the offensive weapon it is and wearing a hat with a feather in it! This kind of complication might demand another whole week of Petey's Playdate to adequately complete. Or more if Andre starts reading that Diminishing Expectations out loud, with gestures. I might've mentioned before that one of the things I don't like to draw, along with crowds and horse's back legs, is a car interior. Every time I write a strip with a car full of people talking I kick myself. Something about the perspective and having to squeeze all the people into it. And all the seats, headrests, seatbelts, etc, and if Alice is in it there's got to be a kid's carseat And then I've got to somehow find room for all those words with the jokes and stuff. When I first sketched out the above strip it had a few panels with an intricate shot of the van's interior and the kids in 3/4 perspective. Then I realized I'd have to ink the damn thing, erased it and then rewrote it to redistribute the lines so I could draw the whole thing from the side, left to right. On the other hand I really enjoy drawing cars from the outside, as long as they're my kind of cars; lumpy things on wheels that are somehow capable of forward movement. And putting a couple of heads in the windows is no problem. Here's the first drawing I did of the Otterloop's van, from the first Cul de Sac strip that ran in the Post Magazine on February 8, 2004. There might've been a few minor changes over the past six years. Alice, for example, doesn't wear that blue dress so much any more. But looking at it now I'm pretty happy with the van, especially the wheels and the teeny cloud of exhaust. And look at how many people I've crammed into the windows! The first consideration with introducing a new character like Andre is figuring out how he's going to integrate into the established social milieu. No it's not! The first consideration is figuring out if Alice will like him or not. From the first indications Alice and Andre may get along Okay. For most of my characters I've got a vague backstory in mind. For example, Beni has an older sister and a baby sister, Nara has a much older brother, Marcus is an only child, Kevin I'm not sure of yet, Dill has too many brothers. Andre I'm guessing is in the middle of a lot of sisters, maybe six. So, there, that means he can deal with Alice just fine, and it probably explains his noisiness too. But since it's only a vague backstory and I haven't mentioned it, I could change it at whim if it no longer fits in with a gag I've thought up. And I'm not likely to mention all these other characters because I don't want the strip to get too cluttered up with stray people, nor do I want to learn how to draw them. Which still leaves the problem of Sofie. I'm not sure who she is yet and I'm not real sure I want to find out. Small children for whom so much is novel are always meeting strange new people and sometimes, inexplicably, that strange new person doesn't like them, so maybe that's the limit of Sofie's contribution. And no one noticed that her name was spelled "Sophie" the first time out so I'd better not mention that either. I like the idea that Alice is protective of Petey, maybe misguidedly, though she's right about the small wet cracker social skills. And that her concern extends to Kevin, though that's mostly an excuse to be overbearing. But I have no idea why they're making folded newspaper hats, a skill that's probably beyond most preschoolers (it's beyond me at any rate; I can only make a little folded paper cup). Kevin was swiped from an old Poor Almanac that featured a roundtable discussion among toddlers. I liked the shape of Stinker's head, so I put it on Kevin. Unless they're one and the same, and Stinker grew up, slightly, into Kevin. I also like the looseness of the above drawing, the handful of stray lines that briefly formed to be Stinker. The lines in Cul de Sac always seem too careful, mostly because I struggle with making all the characters in the frames the correct size, a pretty basic necessity in a comic strip. Petey recently got two additions to his cohort, Andre Chang and Loris Slothrop, bringing the total now to four and a half, if we consider Ernesto as possibly imaginary and therefor not a whole number. Fight it though he might, Petey's needed to expand his horizons for a while and the hard part was figuring out how to do it logically and gracefully and naturally. I read an interview with Neil Simon recently where he discussed writing the Odd Couple and though he didn't talk about the obvious pairing of opposites in the play I kept thinking about that part of it. Petey attending Cartoon Camp had been mentioned a few months ago which meant he'd have to be exposed to new people. And as Petey's fairly meticulous and in perpetual retreat he needed an opposite, other than Alice, someone his own age who's sloppy and loud and big. Somebody who's a nice enough guy with his own weirdnesses, who Petey might like but who'd drive him up the wall pretty quickly. Et voilá, Andre Chang. Loris is put together from bits of anime characters that my daughters like and is tiny and high-energy, on the theory that large, clumsy Andre and inert Petey need an electron to orbit at light speed around them to complete the molecule or atom or whatever. So it's almost like math or physics, both of which I excel at of course. And somehow Alice and Petey made the cover of Linus, the Italian comics magazine, where Cul de Sac is translated and lettered by the astounding polymath Diego Ceresa. I'm tickled because the above drawing is one of the few where I got Alice's hair right. 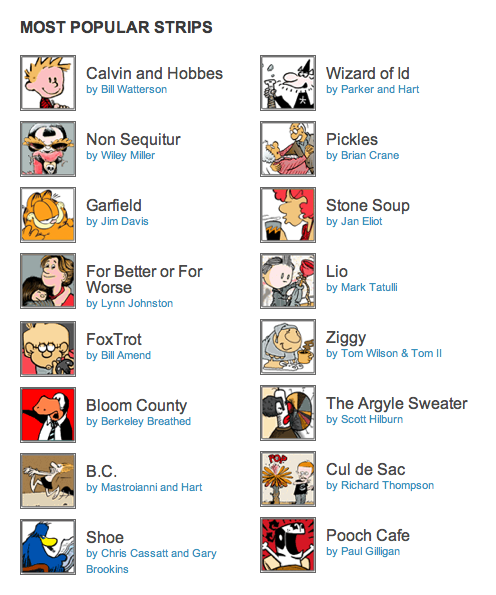 I got an email from my syndicate saying Cul de Sac is in the top 16 comics by viewership at GoComics.com. This is, of course, dang awesome. run daily, or until I get distracted by deadlines, my insane social life, or a passing dust mote. The deal is, I'll post the day's strip and offer some kind of commentary or apology or justification. I could make it simpler and just say "I was on a deadline, okay?" every single time, but that's the lazy way out, so we'll consider that as understood. Ernesto Lacuna, the maybe-imaginary child, is one of my favorite characters to write for. He's something of a Bond villain in embryo, as is evident from his remark about the extinct volcano, and he's enigmatic enough that I can write dialog that doesn't always make sense as long as it's vaguely threatening. But Ernesto's also unimpressive enough that he's hard to take seriously. He's based on several kids I knew who wanted to grow up in a hurry under the mistaken impression that adults have all the power. Ernesto belongs to a group called Future Adults of America whose purpose is to gradually take over the world so that they'll be running it by the time they're in their forties, and he keeps trying to get Petey to attend FAA meetings. Which, from Ernesto's description, is mostly an excuse to issue position papers and to eat doughnuts. Disliking organized activities and food with holes in it, Petey has declined so far. Maybe he should go sometime, as it'd be fun to draw. This is the kind of idea I love, as I can revisit it, explore it further and get a lot out of it. And nothing's better than that when you're dealing with a daily strip. 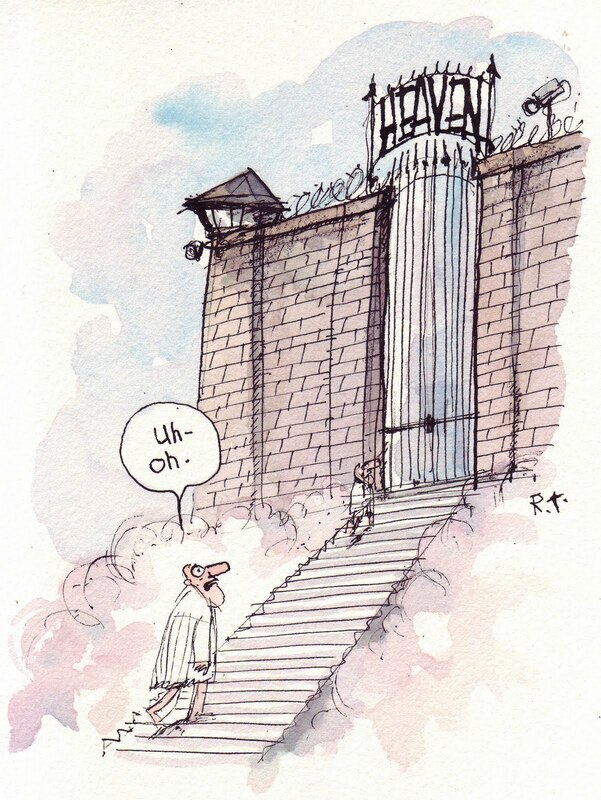 Heaven shows up in cartoons an awful lot. Usually it's St. Peter fussing over the guest list or flocks of angels doing hijinks or Himself wondering if all this was such a good idea. So here are two illustrations dealing with heavenly stuff, both done for the Washington Post Magazine. I don't remember what the story that went with the first drawing was about, but the one below concerned someone with a bizarre business plan. He was going to enlist people with fatal diseases to pass along messages from loved ones to those they would presumably meet in heaven. I can see all kinds of flaws in this scheme, like how would they track the recipient down and what if they, or the recipient, went to the other place? I guess his business didn't catch on, and no wonder, but it did give me a chance to draw this thing. Sorry, I didn't mean to leave the previous commercial announcement posted for so long (though of course, it's still a good time for some panic shopping at Amazon). The below is another old Almanac, this one a parody of a fairly long-running Washington Post Style feature called Roadtrip that suggested interesting places to visit, along with a route map that would link them. And it solicited readers to submit their own, so this is mine. I figure it's a good August, get-out-of-town thing to post. Actually, I'd looked for something more Augusty, but I'd already posted them here and here.